When I moved into this house, I knew that I would be changing the way I lived. Summer's actually cooler in Wilton Manors, Florida than it is in Philadelphia on average. At least it can be in August. There's a breeze off the ocean and while 95 degrees is hot especially with the sun almost directly overhead, it feels cooler than it actually is. Or that's my view of the world. The house came with a pool, something I'm still on the fence over. It also came with a Tiki Bar. We've resisted putting kitchy grass skirts around the bar but there are lights behind it. Bright Holiday Lights to make things Cheery and a few homey touches. You learn to blur the view between home and outside here. On a nice day, I've been known to take my work outside and park my feet up on the railing while editing videos or working on a web page. It's such a nice place to work that I've noticed that my visitors are coming back. I've got these ring neck doves visiting me in the morning. It's almost like they are waiting for a drink. My schedule is that at lunch time, I'm back in the kitchen and that interrupts them. Their good eyesight and hearing means that they hear this big moose rattling around the kitchen and grumbling when the midday meal doesn't quite turn out right. After all, pull the wrong bowl out of the cabinet and you end up with a crap fall of epic proportions. Plus it's outdoors. 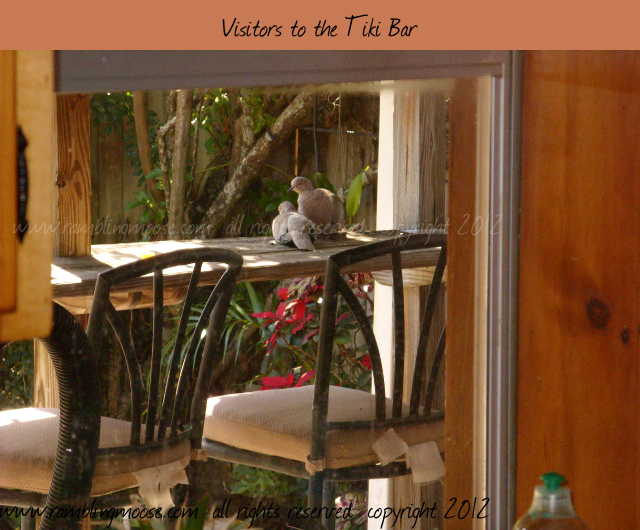 I'll let the little grey birds perch on my bar. They do seem to like it there and if Oscar the Parrot is visible there, they pay him a visit through the window.